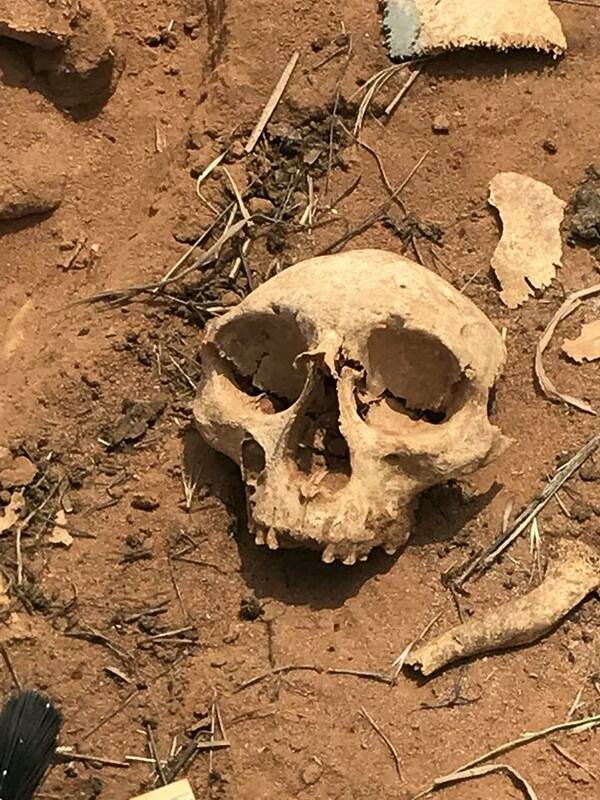 Two government appointed ‘anthropologists’ came, excavated and literally threw them back into the ground without a skerrick of care or respect. Originally both bodies were seated upright, with two arms and knees pressed against their chests facing the east. What we witnessed was totally absent in care and respect with no intention shown to meticulously return as interred, which really is the very least that could be done. Sadly the collateral damage was huge with bones out of order, place and sequence. 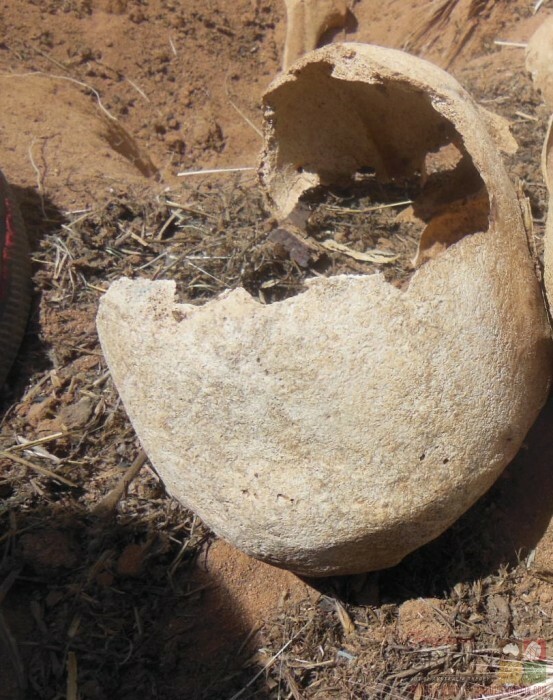 Knowing both skulls and their associated bones are without parallel, precedent or comparison, that may explain why the official anthropologists behaved so poorly on site and never got back to the farmer. Well nearly no-one made further contact, two representatives of a different government department did pop in for a quick visit soon after and threatened the farmer with talk of a hefty fine if news of this discovery did spread. Most would do as threatened and say no more, but not this farmer. He kept looking for the truth. And that desire for an answer finally led to our expedition onto his country plunging ‘heads deep’ into a past of which even I was unprepared. Proving once again how deceptive two-dimensional photographs can be, the first photograph we have presented was taken before the damage two years ago from a position and perspective that reveals so much, yet is equally misleading. As it is from above looking down this skull has the ‘look’ of an Original robust skull which always have large sloping foreheads and brains, a thick ridge above the eyes and large eyes, never as big as this, but the robust skulls do have larger eye sockets than the gracile thinner-boned Original strand. One of our anonymous academics, Professor X, called the skull “massive,”(1) with one equivocation, he had no scale or comparison. But it isn’t! In fact in many respects this skeleton is incredibly fine boned and more gracile than robust. What no longer exists when on site is any trace of a sloping forehead seen in that photo, the volume is correct but the angle is way off. When face to face it becomes immediately apparent that barely a centimetre above the skull reaches its maximum width of 10 centimetres as it does so it also drops back steeply to nearly a flat plain of bone for 12.5 cms. The bone in the skull varies somewhat between six to eight millimetres in width. If not aware of the size of the cranium receding into the background when engaged at the same level, it looks like an ancient smaller-faced Australopithecus reminiscent of ‘Lucy’ found in Ethiopia (Africa) dated at 3.4 million years. As unexpected as this was, it made the actual size of the eyes seem much larger than the 4.4 cms on show in the photograph, simply because with so much of what lays above the eyes merely a backdrop unseen supplemented by narrow cheeks and chin, what remains is a small mouth, small chin, small cheeks, small forehead and absolutely massive eyes. These orbital sockets occupy close to 50% of the face when viewing from eyeball to eyeball. If trying to create a face from the facial bone structure it would look somewhat like the eyes’ of an owl wrapped around a narrow face. What only adds to the intrigue, is a quite severe indentation just above the right eyebrow. There is no sign of a cut or percussion bulb through heavy impact and since there is nothing like this above the other eye it is not natural, but nonetheless very pronounced. Between these two massive eyes, but slightly above and higher is the remains of where the nose began to rise out of the skull, but its positioning is far too high by today’s standards. Noses of recent times begin to rise at an alignment that is close to the centre of our eyes. This being ignores that setting and its nose basically begins where the thick ridge above runs and is about one centimetre higher than all hominid nasal models past or present. The mandible had its teeth in position with the exception of the two front teeth. There were no jagged remains inside, both cavities were clean and empty. Knowing that tooth avulsion was used as form of initiation in the general area it seems safe to assume this individual was given ceremony. After the skull was cleaned and removed the sequence below was more teeth, remaining small fragments of the face then a leg and arm bone. The femur is 43 cms in length, has a maximum thickness of 25 mms, with a femur epicondylar breadth 6.5 cms and maximum head diameter of 4 cms, which all seems quite normal, but the other bone examined, the humerus, was way out of proportion and far too long. It is 41 centimetres in length at present but that was not as far as it ran, the section that made up half the elbow joint is missing in action, most probably through some earlier havoc created in passing some two years ago. What really hammered home the disparity was when I held the femur against my hip and knee the length was almost identical, but when I did the same with the humerus resting on my shoulder then placed it against my arm, it extended past the elbow and continued on to half-way towards the wrist, with more to come. If I add the same extension to the next half, the combined length with a hand attached has to be extremely close to the ankle bone. What only added to the questions yet to be asked, was a width of arm that has to be at least half that of humans of today. So thin is the bone (maximum width of one centimetre) it is hard to imagine how this individual coped if falling, being pushed, in contact with any moving object heavier than a feather or even the recipient of a solid hug. The bone would literally snap! Barely a metre apart, the second skeleton and skull is as different in every respect as could possibly be imagined, and then some. That they were buried in such close proximity is yet another unusual feature in this evolving mystery. Obviously not of the same genes and physiology, the idea that two such divergent people were buried beside each other is another rare to unknown aspect of this whole arrangement that transcends so many boundaries. Equally that two beings so diverse in so many ways were given identical funerary ceremonies and methods of interment only adds to the unique nature of what has been unearthed. It may be that this is the skull the blade hit when first clearing the land, or another example of poor field work and a disregard for culture, we have no information as yet to add clarity to the cause, but either way the effect was that the skull and face are shattered and the largest piece left to examine is what amounts to be about two-thirds of the skull cap. Virtually following the same sequence to the burial close by, the order of removal was skull cap, mandible and dozens of facial bones, a leg bone then arm. The skull cap has a thicker ridge above the eyes and is 12.5 cms wide, 17.5 cms long and has a maximum cranial length of 19 cms with a much thicker bone in the casing of up to 1.3 cms. It also slopes back at a considerable angle, but not as severely as the other skull. At the back of the skull is yet another irregularity, in the form of what looks like a one centimetre square knob of bone. At first glance, if reliant upon timing that has to be short before an extremely obvious omission overwhelms the scenery, it seems to have the classic appearance of a robust skull. Above and beyond the apparent similarities there is one unprecedented leave of absence, the crucial central sagittal suture that invariably runs across the skull is not there, and nor are the other two sutures accounted for. This skull has no sutures whatsoever, and that is unheard of and runs counter to a central tenet of human development. One of the fundamental separations in the supposed road between apes and hominids relates to the fact that hominids have a skull consisting of three separate plates that slowly fuse together after birth, this supplies an elasticity and capacity for the cranium to expand. The gradual merging of three plates explains why the general species of hominids can encompass brain sizes of 400 to 1400 ccs over the last five million years, so say the experts. The same academics point to the fact that all great apes and possibly one primitive cross-over species have a sagittal keel which runs like a solid crest along the same alignment as the sagittal suture. The suture allows expansion while the keel denies any movement upwards or any other direction, the skull size is permanently fused. That is the rule, well it was but this skull runs in the opposite direction and is certainly not related to the apes as there is no keel, yet nor is there any sutures so the question still remains, what species is this that logically can be neither of the supposed only two earthly options? That inference may seem a touch radical, but this lack of suturing is an elemental omission and should not be thrown back into the dirt, that is appalling science and grossly disrespectful. The size of the eyes can be determined, but only after all the shattered remains are collected and assembled by experts in such matters. The same can be said for the rest of the face, the many small components that have been disassembled can be reconnected. My apologies for weakening through pandering to my addiction for tacky alliteration, but the tooth given to me by Michael after receiving the Elders permission and is too important to be passed over as another minor appendage to the skull and needed a banner. 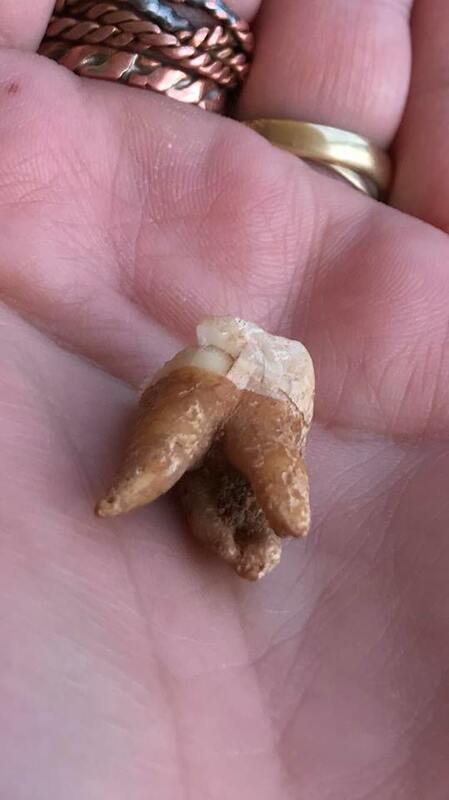 This tooth and many others on site have three roots and after some extensive research by the ladies in our group the closest equivalent in measurement and presentation is to a tooth recently found in China. Despite a serious shortage of accompanying facial bones the researchers are confident that date of between 100,000 to 120,000 years is applicable. Where it does become controversial is their claim that this individual had a massive brain size, far bigger than any Homo sapiens sapien, of 1,800 ccs. The tooth measures from corner to tip 2.45 cms with a width of 1.55 cms, every tooth still attached to this mandible is evenly worn with no sign of dental decay. Of course even today there are isolated incidences of back teeth with three roots, but not in this configuration with the single root curving quite dramatically to the right. In providing the extra room for each tooth with such a wide base for the roots to attach, necessitates a much thicker and wider mandible (jaw). What is not so much an afterthought, but the beginning of the search for deeper truths could be the appearance of a lot of grey fur in this grave. There is no pelt as such, but the fur looks a lot like those on the coat of a grey kangaroo. As to why it is there, it could be that because that coat is often worn by Law-men, and since the burial is obviously the result of much respect and planning, it is possible this person was also a Law-man. With another sacred ceremony involving tooth avulsion taking place a metre away, this is not a huge stretch in complementing a national reverence for all things mystical. That this is a sacred site, is undeniable, and it is highly likely there are more bones and beings interred further along the same slope. 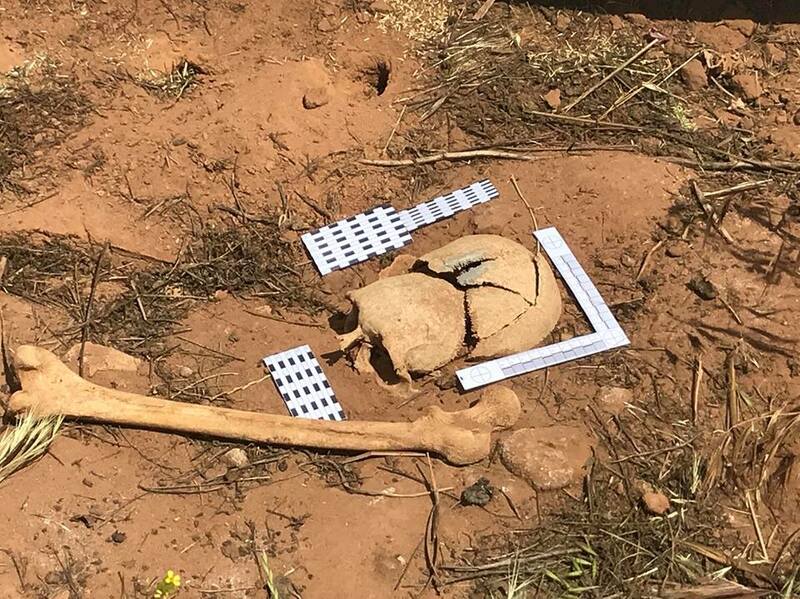 What did originally not make a lot of sense was the positioning of this burial site, found in the middle of the paddock at least two hundred metres from the major river of the area didn’t resonate as an appropriate position for such an important person/being. An imposing tree, on top of a mountain or on the slope beside the riverbank overlooking permanent flowing water are all much better options than a slight rise on a featureless flat plain. However, that is today’s thinking which rarely applies to ancient days. Particularly those of 30,000 years ago when a massive shift in the surrounding countryside was caused by the Caddell Fault, before that shift the river was actually just below where these graves are today. Under those ancient conditions any burial before 30,000 years makes sense, and supplies a fairly reliable minimum age for both skeletons and skulls along with those yet to be examined. 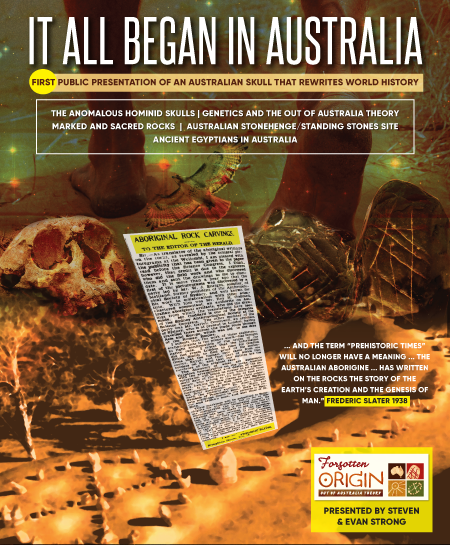 What has been seen, briefly investigated, photographed and filmed are two ancient Australian hominids/beings that are completely different, have never been seen before and were found buried alongside each other. They demand that a completely new version of humanity’s past be acknowledged with many new additions required that can be summarised in one rather lengthy, verging on awkward, sentence. Found in South-East Australia is a very thick cranium that recedes backwards 18 cms but is lacking in any of the three sutures all hominins share, many teeth with three roots, two eye sockets that occupy close to 50% of a face that has a 1.5 centimetre forehead, arms so long and thin that the fingers almost touch the ground without bending down, a skull case that slopes back at nearly 180 degrees, a very intriguing large indentation just above an eye-brow ridge, and to top all of this off although completely different beings, they were buried next to each other over 30,000 years ago. Past these facts and bone solid hard truths it becomes more pliable. One avenue we intend to pursue is the possibility that so extreme are the features of these two skulls and skeletons it is feasible that they are not only the ancestors of all Original people, but the ‘Adam’ and ‘Eve’ whose genetics lead to the emergence of a new hominin strand that spread throughout the planet: Homo sapiens sapien. As radical as this may sound it actually isn’t our idea, but that of Professor Rebecca Cann. Cann, along with Professor Alan Wilson, presented a seminal paper validating the Out-of-Africa theory thirty-five years ago. 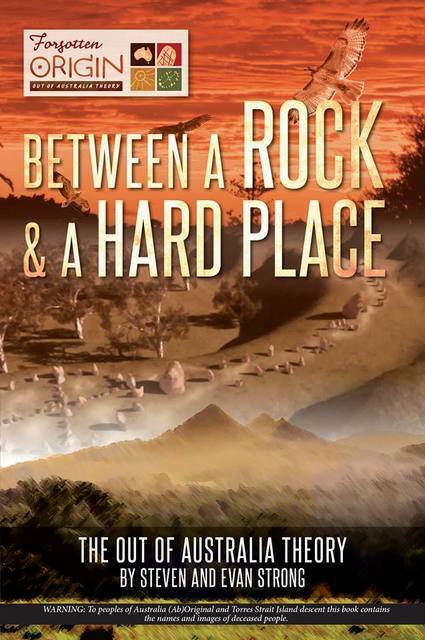 Both realised they were wrong in geography and that Australia was the correct birthplace, but it was Cann who initiated this the reversal through further independent research comparing genetic samples “of 112 humans, including twelve Australian Aborigines.”(2) Her analysis put “the origin of Homo sapiens much further back and indicates that the Australian Aborigines arose 400,000 years ago from two from two distinct lineages, far earlier than any other racial type.”(3) In the model provided she highlighted “Gracile Australians”(4) and “Robust Australians”(5) as the two groups she felt spawned the entire human race. What has been found in a sandy dry mound are two ancient Australians of “two distinct lineages.”(6) What if a small piece of bone had its mtDNA analysed and turned out to be what Cann suggested as one or both sets of Australian genes from which all races evolved? Surely that result, or any other, is pivotal in what follows next? Why not call on science to adjudicate, at present one group wants the skulls hidden and neglected, the other group insists that transparency and science is the right path to travel. At the moment the cone of silence reigns supreme, but that has to change and it has to happen now. Tomorrow is too late. 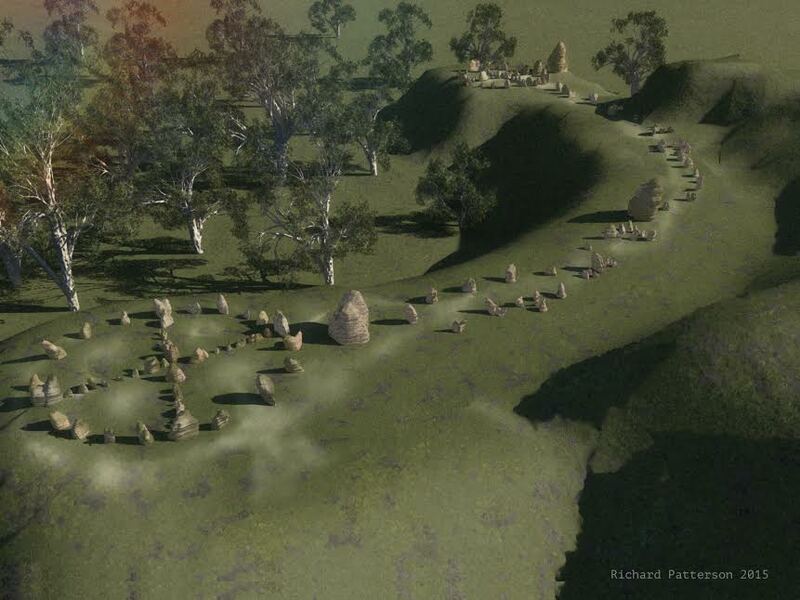 # The five minute film/trailer featuring these skulls and bones compiled by David Bradbury, will be premiered at a public protest meeting fighting for the Standing Stones Complex to be returned to Original control at the Mullumbimby Hall December 12th, 7-10:30 pm. (1) Professor X, 2017, Personal Communication. (2) Robert Lawlor, 1991, “Voices of the First Day”, (Inner Traditions International, Ltd: Rocherst, Vermont), 26. 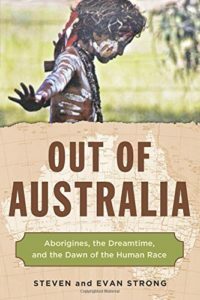 The Aboriginees of Australia keep saying that they were here when the First Sunrise came to Earth thus they would have been living in Darkness & therefore been ‘Nocturnal’ & this could explain the large eyes. THANK YOU …. YES …. I KNEW IT … Just YEARS of research …. 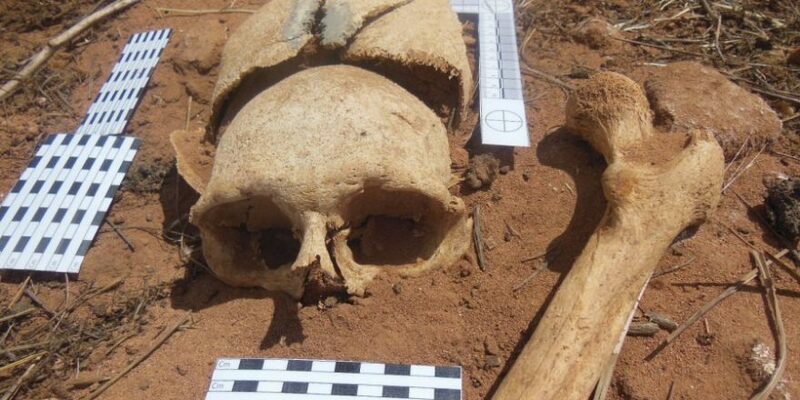 the reason Africa has been touted as the Origin is not because of Real Science or Facts but only due to the fact that ancient human remains have been found there. The reason is that Africa is a very Young continent therefore it has a lot of sediment left. Australia is an Ancient Land therefore very little Sediment is left here thus not much left to be found (easily). But you have nailed it. There is a LOT more to be found here yet, I am sure of it. I also believe that Antarctica is important & if the snow & ice melts much will be revealed. Also the Ancient Denisovan line is only traceable in the Papua New Guinean’s. Then the remains of ‘someone’ that was found in Indonesia that is not human in that it does not have human DNA at all. The world came to Australia for Spiritual teachings, knowledge & understanding ie fact that Ancient Egyptians visited our shores and were geographically knowledgeable ie mapped the world. This is why Archaeologists are coming to Oz looking looking looking for remains. Thank God that this Farmer was an honourable man & did the Right thing by not accepting ‘government’ bulldust & wanted to know more & sought experts for answers. Thanks to that Farmer. Just reading another comment re: large eyes for nocturnal animals — remember Indigenous saying that they were here when the First Sunrise happened so they were alive Before the First Sunrise thus they would have been Nocturnal as they lived in Darkness until this came. THANK YOU …. YES …. I KNEW IT … Just YEARS of research …. 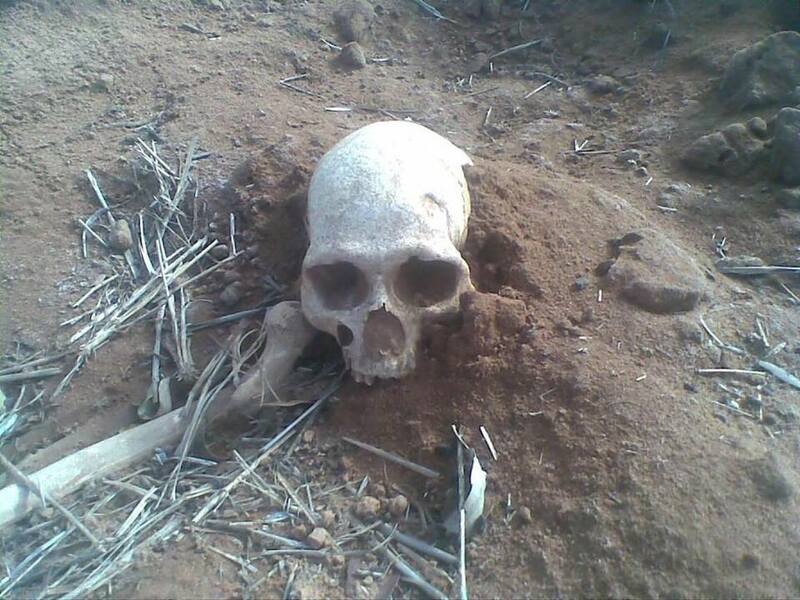 the reason Africa has been touted as the Origin is not because of Real Science or Facts but only due to the fact that ancient human remains have been found there. The reason is that Africa is a very Young continent therefore it has a lot of sediment left. Australia is an Ancient Land therefore very little Sediment is left here thus not much left to be found (easily). But you have nailed it. There is a LOT more to be found here yet, I am sure of it. I also believe that Antarctica is important & if the snow & ice melts much will be revealed. Also the Ancient Denisovan line is only traceable in the Papua New Guinean’s. Then the remains of ‘someone’ that was found in Indonesia that is not human in that it does not have human DNA at all. 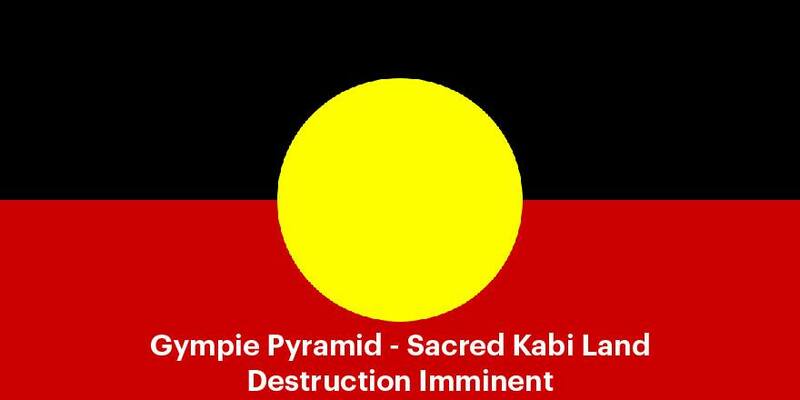 The world came to Australia for Spiritual teachings, knowledge & understanding ie fact that Ancient Egyptians visited our shores and were geographically knowledgeable ie mapped the world. This is why Archaeologists are coming to Oz looking looking looking for remains. Thank God that this Farmer was an honourable man & did the Right thing by not accepting ‘government’ bulldust & wanted to know more & sought experts for answers. Thanks to that Farmer. Congratulations on what appears to be a most important & wonderful discovery! I was looking forward to attending the meeting at the Mullumbimby Civic Centre tonight 12 December but Duncan Roads told me that it has been cancelled. Is that true, can you contact me & tell me if another meeting is planned? I might come along anyway in case it is still happening. I attended an illustrated talk by you both, Steven & Evan Strong, at Robert & Irene’s castle near Uki some years ago. Well, I can see what are clearly suture lines in a couple of these photographs. The skull craniums without sagittal sutures are rare but known to exist in human adults. If there are no sutures at all I wonder how did this individual survived to adulthood if he/she was born like this. The other alternative could be that sutures were all there but for some reason all fused up when the individual reached the adulthood. This is a mystery in any case. I am not sure if I can help as I need more experience with bone handling. You probably need someone with Honours or Masters degree in bioarchaeology. I am planing to get mine by the end of 2020. I m very intereted by this story. Has DNA tasting been done? With science we could know , now a lot more about this. Could I get more info about that? There is only one problem with radiocarbon dating, if the yardstick it uses to measure age is wrong, all other measurements of age will be off by the same magnitude as the yardstick. It will still give the correct relative timeline between events, but not the correct age. There is nothing wrong with the actual science of radiocarbon dating, it works, but it relies on the “science” of archaeology to get a yardstick foundation measurement of real time. The yardstick of used is the assumed date of 79AD for the destruction of Pompeii by the Mount Vesuvius volcanic eruption. Modern analysis of historic timelines by Dr Anatoly Fomenko indicates the eruption event may have been as resent 200 to 300 years ago, making any dating using the older date, off (older) by 5 to 6 times in age. Radiocarbon dating, calibrated using the incorrect age of one event. Why would the authorities just disregard them in this manner it makes no sense? Hi Steven, what a fascinating article about a very exciting find. 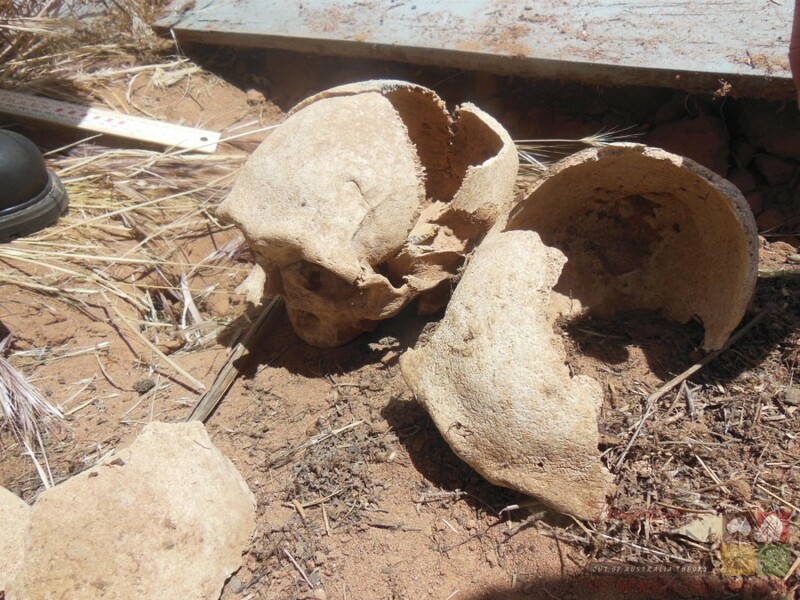 It is reminiscent of Lloyd Pye’s –‘Starchild Skull’–two totally different skeletons buried together. I hope you do not have any of the problems Lloyd Pye had in trying to get them assessed properly. Is there any arrangement yet made for carbon dating I wonder? Good luck with it all. I would come to Mullumbimby for the meeting but will be in Victoria at that time. – The big eyes make one think of Wandjina. – The long arms and delicate frame, Mimi (might explain the kangaroo fur). – Analyse the Teeth Enamel for traces of pollen, or grains, etc. 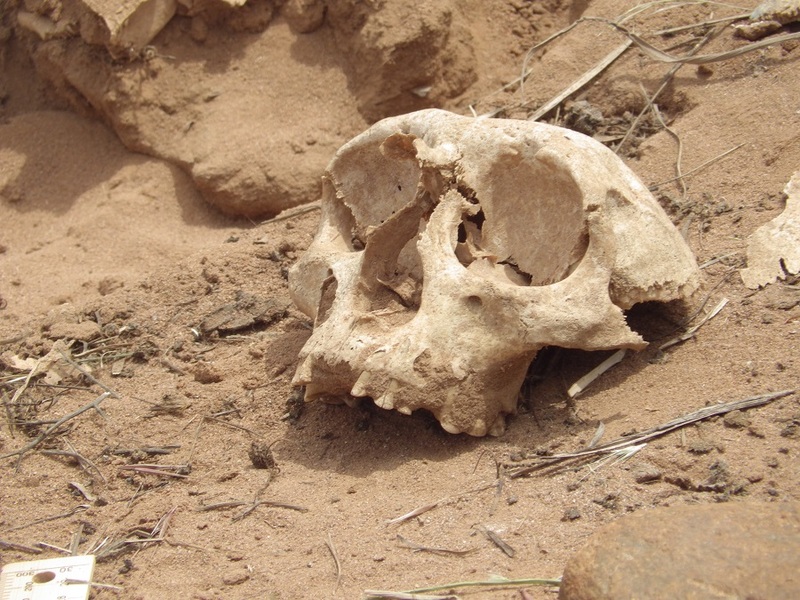 to identify if what was eaten was from the same region the skeletons were found. – Check the bones for radioactivity. – If you have any way to know the exact direction they were facing, look as they would look, and see what features of the landscape present themselves.